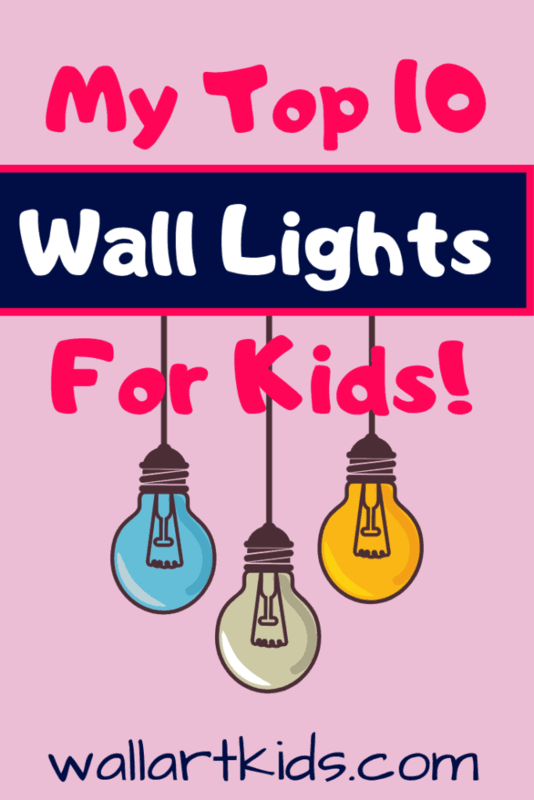 Make Their Rooms Magical – My Top 10 Wall Lights For Kids! One thing that can transform a room instantly – is lighting. There also happen to be some fantastically fun kids lighting options available now. If you’re looking for a special finishing touch to a themed room…. A novelty wall light could make all the difference! They’re also loads of fun. When I was a kid, I always loved twinkle lights stuck to the wall. You can actually create brilliant patterns by nailing small nails or pins to the wall and weaving the twinkle lights around them. I used to have some in the shape of a star, surrounded by those little glow stars you can buy. The great thing about many of these wall lights for kids are now battery operated, so no plug socket nearby required, which means your child can have the light right by them next to the bed. For the ones that do require a plug socket, many use energy efficient LED lights which do not get hot and therefore, make it very safe for your child with no risk of potential burns. With the recent edition of adding a wall sticker behind the lights, you can by your child’s favorite character in light form – that looks as though it is crashing through the wall or other scenarios. I can see these new more creative forms of lighting will only continue to grow – which is fantastic news for kids, whose rooms have the potential to become more exciting than ever. 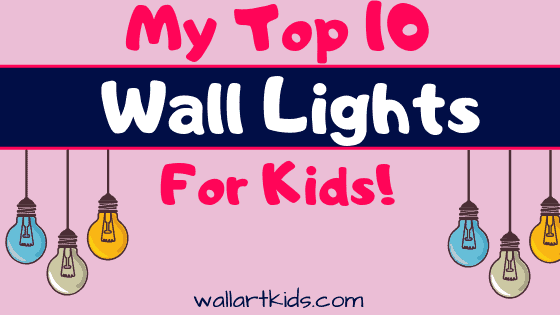 Here is a list of my TOP 10 favorite kids wall lights, enjoy! 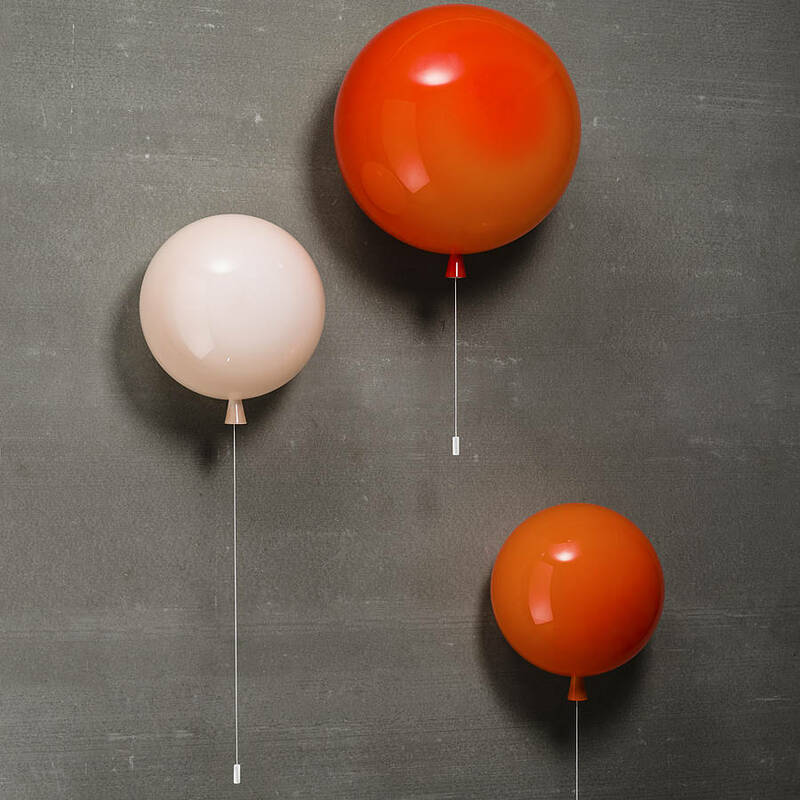 My children are balloon obsessed and this set of balloon wall lights really stood out for me right away. Three sizes available, small medium and large. Requires standard bulb – E27 15w to 23w depending on the size of balloon light ordered. Also a gorgeous ceiling light version available here. This flower wall light is so adorable. 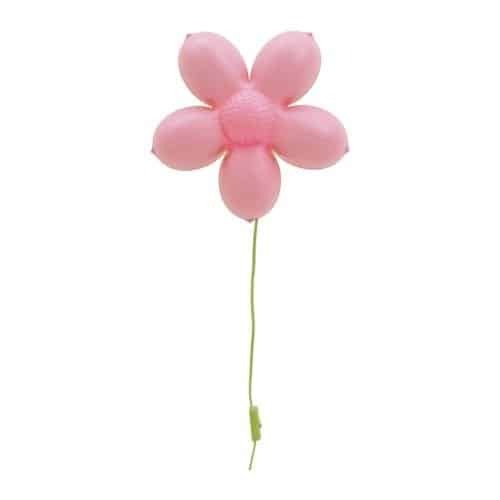 This one also looks like a balloon! Superb value for money. Bulb not included but takes a E14 bulb (Max 25W). Smila Blomma Lamp, Check Availability. Sweet Moon wall light from IKEA. 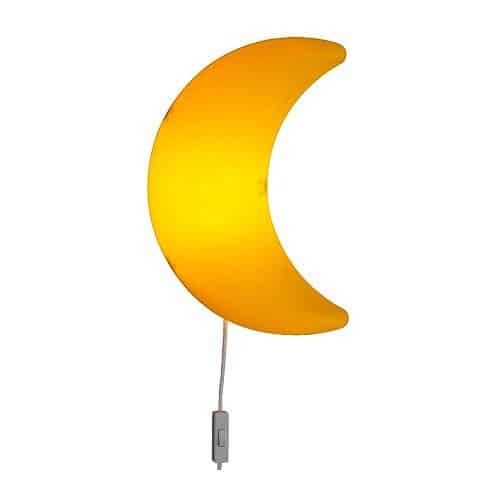 Ikea Yellow Moon, Check Availability. There are some great 3D wall lights available, like this one! 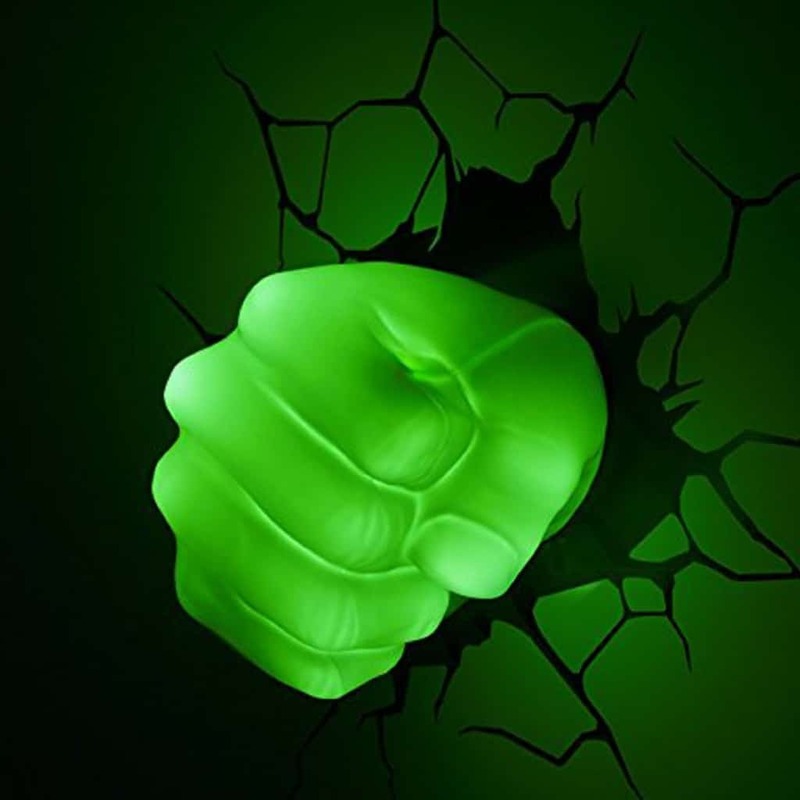 The incredible Hulk’s hand smashing through the wall! This wall light would really add a wow factor to a super hero themed room. You could team it with some comic-strip or superhero wall stickers. Cordless and battery operated – so super safe for your child’s room! Marvel Hulk 3D Wall Light, Check Availability. 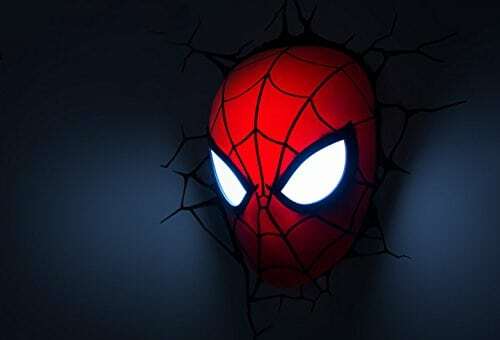 Another one in the Marvel series, an awesome Spiderman wall light. This one would be perfect teamed with Spiderman Wall Stickers. Simple on and off switch. Uses energy efficient LED bulbs which will never need changing. Spiderman 3D Wall Light, Check Availability. This has to be one of the best wall lights I’ve seen. A brilliant minions wall light and there are three options to choose from – either Kevin, Bob or Stuart, or all three minions. Plus you can pair one of these lights with some Minions wall stickers to complete a themed room. Child safe, cordless and battery operated, does not heat up. 3D crack wall sticker included. 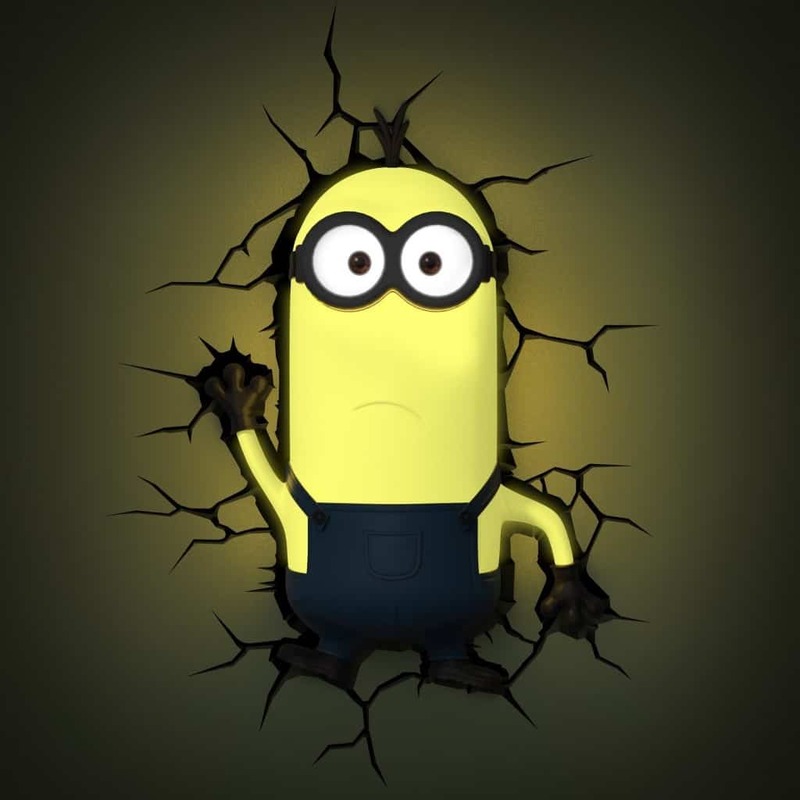 Minions 3D Wall Light, Check Availability. 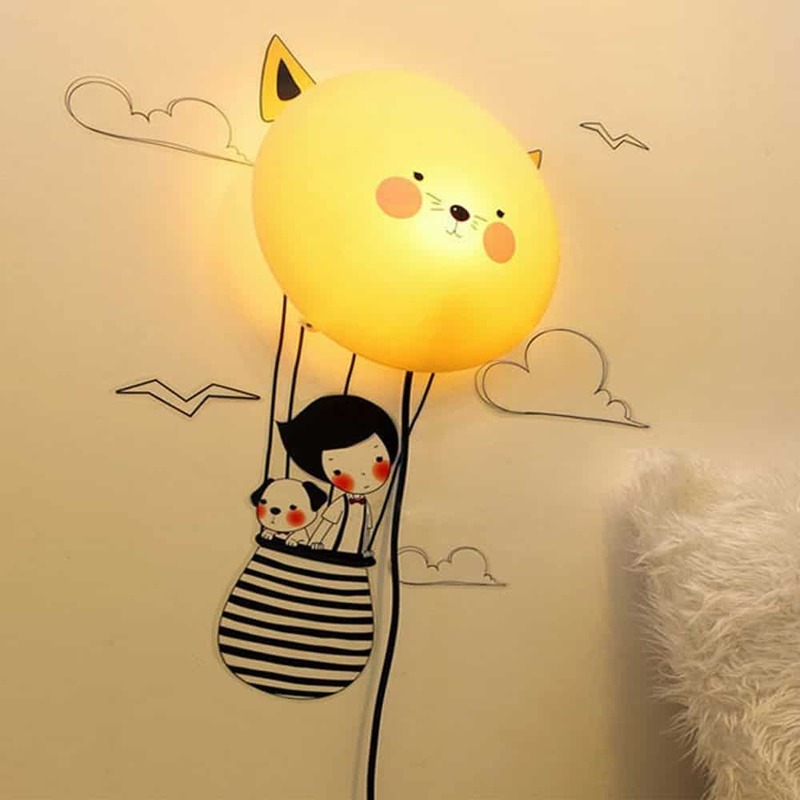 This Balloon wall light with wall sticker, would make a magical edition to a kids bedroom. Clest F&H Balloon Wall Light, Check Availability. A fantastic Olaf Wall light! What a special edition this light would make to any Frozen fans room. Teamed with additional Frozen Wall Stickers – this light would look amazing. LED lights – never gets hot. 3D cracked wall sticker included. 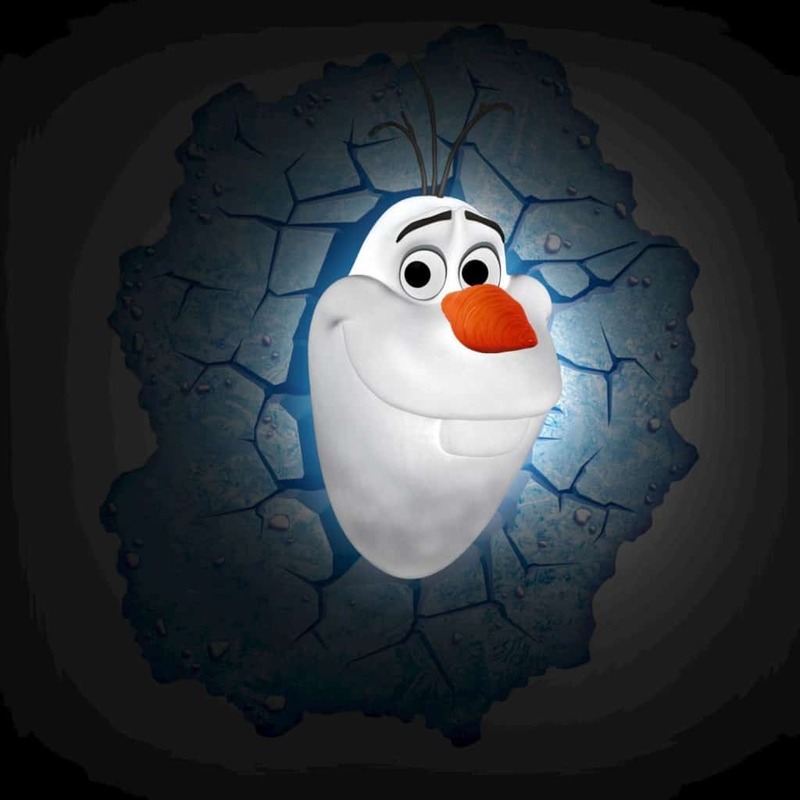 Disney Olaf 3D Wall Light, Check Availability. An inspiring light for Star Wars fans – a Death Star wall light. Sends haunting shadows around the room. LED lights – never gets hot to touch. R2D2, Darth Vader ,Boba Fett and YODA are also Star Wars themed lights available. Death Star 3D Wall Light, Check Availability. Lastly, but by no means least – this brilliant 3D wall light. 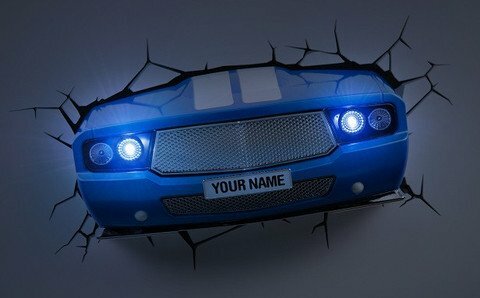 Car light inclusive of cracked wall sticker. LED lights – does not heat up. 3D Deco Car Wall Light, Check Availability. So, that concludes my top 10 kids wall lights post! Do you have a favorite? Leave me a comment below! If you found this useful, you may also be interest in….. These wall lights for kids are really cute! Can these wall stickers be put on any Kind of wall or are there requirements for the surface? Wall stickers can be used on any smooth flat surface. Painted walls, glass or even metal can normally hold a wall sticker. But as for using the wall lights with the sticker, generally they’d be better used on a painted wall rather than one with wall paper – as the paper underneath may tear on removable. But other than that, a smooth flat surface is all that’s required. Wow! I never knew there was such an awesome assortment of lighting for kids. I really love the balloon lights. Such a playful and ‘light’ feel to them, pun intended. My nephew would love the Hulk fist coming through the wall as well. I am bookmarking this page, Christmas is on its way and you’ve got some unique products here! Thanks. Hi! That’s great – the balloon lights are great, there are so many great ones to choose from now. I hope your nephew enjoys the light if you do get one – the hulk light is a great choice, one of my sons favourite ones too. All the best to you! Fantastic list over cool lamps! My son need a new lamp right now and he loves both Spiderman, Starwars and the Hulk… He loves this lamps but we’re having a hard time deciding. My two year old daughter loved the balloon lamp and the Olaf lamp from Frozen. Boy.. we have some choosing to do. 🙂 Thanks for the great post. It is advisable to have a night- light in your child’s room because children fall prey to their rich imagination assuming under the bed, in the closet or under the table lie all sorts of scary characters. So, it’s a good idea to have a night light to help them get to sleep and some of these are great – It is a perfect present for Christmas! Thank you – yes my son has got a little bit afraid in the dark recently and a night light really helps because it isn’t too bright to keep them awake, but it’s still enough that they can see around the room and they’re comforting. Many thanks for your comment :). I really like your selections of kids wall lights. The two I like best are the Minions and the Star Wars. 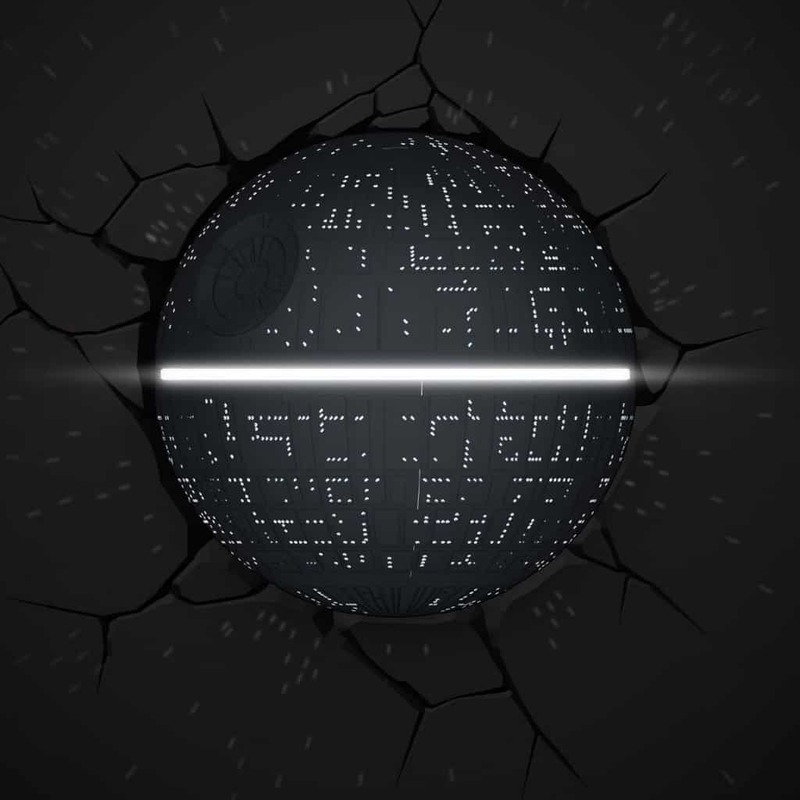 Does the Death Star come with the cracked background sticker? Are the LED bulbs included? What kind of batteries does it take. Can I use Rechargeable Batteries. Are these items available in the United states. I know this is a lot of questions, Christmas is coming and the new Star Wars movie is coming also. My little guy wants to see it, this light would be nice for his playroom. The Death Star Wall light comes included with the background sticker, the LED lights are also included. It is battery operated, it used 3 x AAA batteries. You can pick up the death star wall light for $71.95 right here in the US. I can’t see that the minions wall light is available right now. There is a 3D yoda wall light for $39.99 over here — many thanks for your comment, I hope that helps! I’m not sure how long these lights have been around, but this is the first time I have ever seen them. They are so cool that I know my grandkids would love some of them. I’m going to have to check into which ones they would like the most other than I know one of them will be spiderman for one of the five kids. Great idea and liked the post. Great, pleased you liked them! These wall lights are simply beautiful, I love them all and i could use the Star Wars Death Star in my room. It should give a beautiful effect too. I will be returning to your page to check on new products. Thank you for your great ideas. Are these wall stickers really safe? do they really hold the weight? Really pleased you like them :). I love the star wars death star light! The lights are surprisingly light weight and they are very safe – there are no sockets to deal with, the lights don’t heat up and the bulbs are long lasting. So, they’re a great value purchase for how brilliant they look. Many thanks for your comment! Unfortunately my kids are now a little old for these but I have a nephew that is just crazy about the hulk and his birthday is coming up so I think this would be an awesome birthday present. Don’t the kids these day’s get all the cool stuff? I would have loved one of these when I was a child! Thanks for pointing these out as we all know kids seem to sleep better with a night light in there room. Hi there, absolutely! I would have loved these lights when I was young. I would have really enjoyed wall stickers too. My youngest is a little afraid of the dark too, there are some great night lights out there now – actually I think I will do another post on that because I’ve been seeing some great products. Many thanks for your comment! Wow I love the wall lights, I’ve actually not seen these before. I wouldn’t mind one of these for my little boy, if you come across any zoo animal ones, I would love to hear from you. Thank you Dawn – absolutely, I will let you know if I come across any Zoo animals! I didn’t realize 3D lights such as this existed until I read your post. Some of these lights are just amazing! I think I may have to look for some that will match my house decor, plus I may just have to get the Superman or Hulk lights for my nephews! Some of these wall lights are absolutely amazing. Many of them defy logic, lol. Nothing like this existed when my kids were young enough to want something like this. I think kids (and parents) are very lucky with the choices they have available to them today. I particularly like the 3-D car wall light. Hi there. I love these lights also — I’m a geeky adult myself and they certainly all appeal to me lol. Thanks for your comment!